Charles Dixon, son of the artist Alfred Dixon, specialised in Naval, Maritime and Military subjects. He depicted a number of World War I events including the Gallipoli landings. 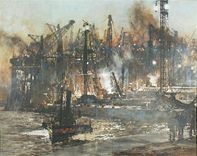 He regularly exhibited at the Royal Academy and was a member of the Royal Institute of Painters in Watercolour. For a period Dixon worked for a number of illustrated newspapers including the Daily Graphic. This picture was originally presented by the proprietors of the Graphic to A J Young as a shooting trophy. 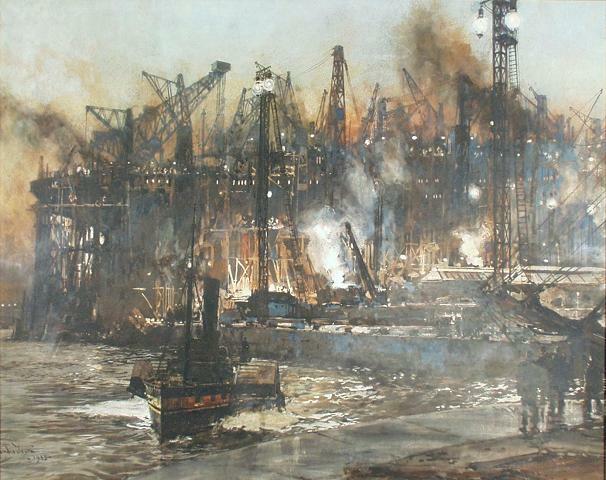 In this drawing, Dixon captures the atmosphere of an un-named shipyard with great skill and a clear understanding of the subject. The noise, smoke and frantic industrial activity created by the shipyard is palpable.